1 of 2 In a small bowl, whisk together lemon juice, chopped red onion, chopped oregano, minced garlic clove, salt, pepper and sugar. Slowly whisk in olive oil. 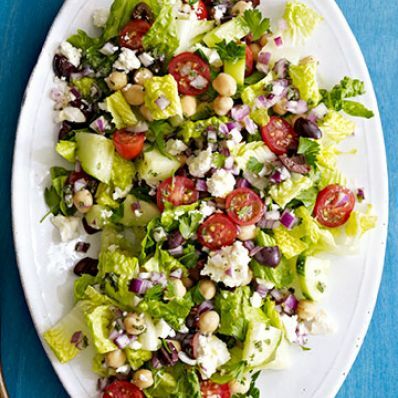 2 of 2 In a large serving bowl, combine hearts of romaine, cucumber, cherry tomatoes, chickpeas, chopped parsley,kalamata olives and feta cheese. Drizzle with dressing and toss well to coat; serve immediately. Per Serving: 13 g pro., 330 kcal cal., 21 g Fat, total, 26 g carb., 8 g fiber, 840 mg sodium, 5 g sat. fat, 10 mg chol.